Add a touch of color to your bathroom with a Kraus glass vessel sink. Handcrafted from tempered glass, this modern bathroom sink coordinates with a variety of decor styles. A freestanding basin design creates a dramatic look with contemporary appeal. Vessel installation offers an easy top mount option for all your stylish bathroom ideas. The textured surface of the sink is dynamic and requires minimal maintenance to keep clean. Pair this sink with any single hole vessel faucet for a beautifully coordinated look. Dimensions 16.5 In. X 16.5 In. X 5.5 In. I am so glad i bought this! I purchase three different sinks (all were beautiful) and chose this one, it looks even better than the picture! In the picture it looked more dull colored but Its more shiny/glassy, which was a definite plus. The colors are great on the inside and outside of the sink, i would definitely recommend this to anyone, it's great! What you cant see in the pictures is that it actually has gold metalic flecs in it. It is not overly gaudy though. It really has a WOW factor to it. Everyone that comes into the house and uses the bathroom that it is in comments on it. I shopped and shopped for a really good deal on a sink like this and thought that I was taking a gamble because this sink is a fraction of what you will find similar sinks anywhere else, the gamble paid off. We have pretty hard water where we live and what is unblelieveable about this sink is that when it dries there are no water spots so it doesen't need a lot of cleaning. We have a 500k+ house and it fits in as if the sink costs 500$ +. Infact on of the subs that was working on the property commented and asked if we got it at one of the higher end shops in town! OVERSTOCK IS WHERE ITS AT!! This vessel sink is gorgeous!! This is a beautiful vessel sink. When I first opened the box, I felt it may be a little too glitsy for our bathroom but decided I couldn't live without it. This is the most gorgeous sink I've ever seen! It is truly a work of art, & I am pleased to be able to install it in my new home. It is going on top of a vintage mahogany buffet for which I am having a custom granite top made & turning into a vanity. I'm pairing this sink w/the oiled bronze bamboo faucet. Can't wait to see the final effect! Overall, this piece is visually stunning. As another reviewer reported, there is an orange-y glow in the very interior ... like molten metal ... has an ethereal quality. Really, really wanted to make this work, but just couldn't with my existing colors; sadly, had to return it. The color looks good with bronze, coppery, and polished nickel metals ... not so much with satin/brushed nickel. Really pleased with this beautiful sink. The dark rich copper color is as pictured. 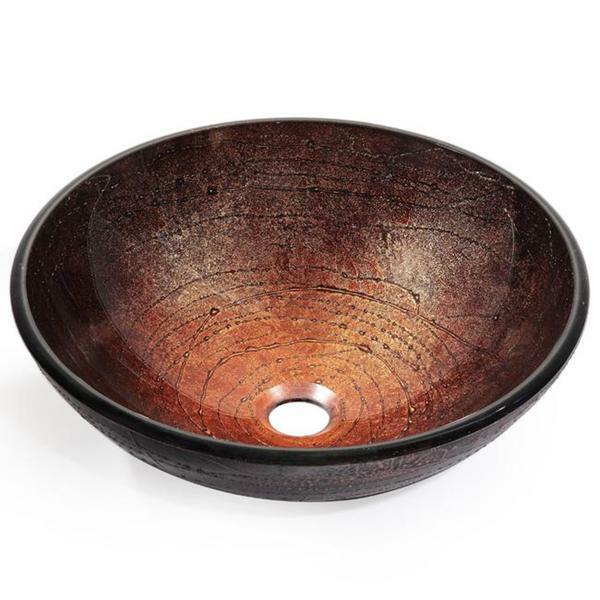 I ordered the oil rubbed bronze pop-up drain that was offered with it. Should be a show stopper in my guest bathroom. I was building a new house and wanted to include vessel sinks in two of my bathrooms. The plumbing supply company where I ordered the rest of my fixtures priced vessels starting at over $$$ and up. I knew I couldn't pay that much for them, so I came to Overstock. I was pleasantly surprised at the selection of vessel sinks they had to offer. I was excited to find this one because the color would work so well with the granite counter top I had chosen, and it was much cheaper. When I received the delivery, the sink was everything it was portrayed to be on the website. It is a beautiful addition to my bathroom, and I get rave reviews for it all the time. This sink is more beautiful than pictured. It's very sculptural, textured with glowing colors. I love it. We are pleased with the glass vessel sink. It was just what we were looking for and the Overstock photos proved to be quite accurate. The bowl arrived in perfect condition. The product was packaged very carefully. Awesome buy. Arrived quickly. Packed perfect. Look like something I couldn't afford. Beautiful sink, much nicer than the Big Box stores, and a much better price! More beautiful than the pix. Drop-dead gorgeous. Exceeded my expectations. This has gorgeous deep bronze, gold, amber colors that the picture just does not do it justice. The dark brown texture on the outside help lend to it's uniqueness.It is first class , and was packaged well. This sink was pretty and looked more expensive then it was. Beautiful shimmer and reflection off of the vanity lights. Perfect in the powder room in our new house. Excellent quality. People love it. I actually bought 2 for my master bath. The quality was so much better than I expected. They are very heavy. And they look more beautiful than they do in the pictures. You won't regret getting it. Just the right touch for our main bathroom! Beautiful copper patina!!! I purchased this for my Master Bathroom and it is absolutely beautiful. Looks really rich. The color is beautiful and everyone comments on it. It is gold on the inside and becomes a beautiful dark bronze. Looks very expensive. I've had this sink for over 5 years and it is still beautiful and easy to clean. Love it! Already have one in another bathroom and love it!! "How do you clean this sink? Will water marks show?" To clean this item, use a glass cleaner and a soft rag. We are unsure if water marks will show. very carefully:) It is so beautiful. Glass cleaner will do just fine or some soapy substance that is not abrasive. I have used glass top stove cleaner on mine for water marks. Doesn't scratch and leaves it smooth and shiny!